When looking for a frame for my free printable established print, I got caught in the Amazon wormhole. I spent probably a good hour looking at decor for my house. 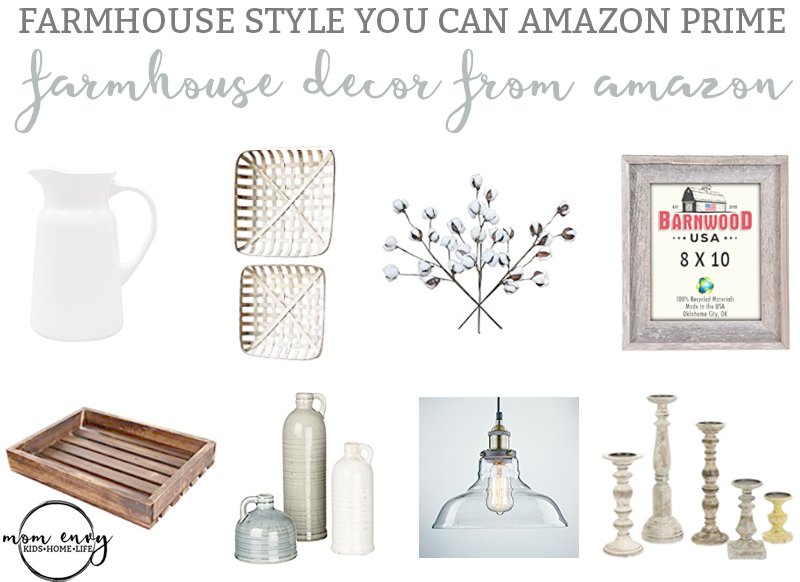 I was amazed a how many farmhouse-style items are available on Amazon (all but one are Prime eligible). There are beautiful pieces that look like they came from a local handmade store or antique shop. 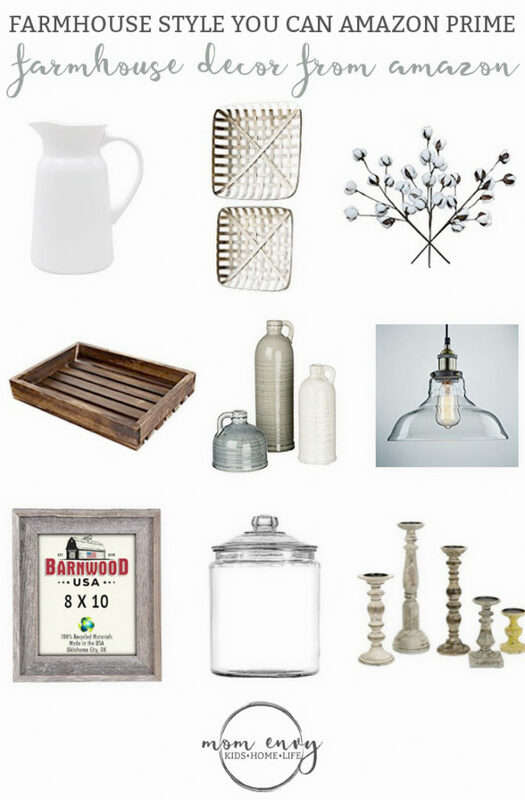 Many of items are similar to ones you’d find in one of Chip and Joanna’s Fixer Upper houses (my favorite show, they are so endearing). 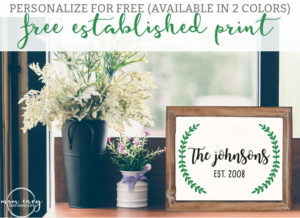 If you’re looking for a free customizable farmhouse-style print, check out one of my recent posts. It would good perfectly in one of the farmhouse frames below. This rustic white frame that also comes in blue and gray. It’s available in three sizes: 4 x 6 ($9.40), 5 x 7 ($12.42), and 8 x 10 ($16.30). This barnwood frame comes in multiple sizes, starting at 4 x 6 through 24 x 36. I love simple white pitchers. They can be used in decor or for their actual intended purpose. This simple pitcher comes in at under $15.00 making it an inexpensive way to add some farmhouse style. Unlike the pitcher, the set of tobacco baskets will run you a little bit more but they can bring character to any home. They can be hung on a wall as wall decor or sit on a mantel leaning against the wall. I don’t know about you, but I love Edison bulbs. This simple light comes at a great price. I wish I had an island to put them over. This tray would look adorable sitting on an ottoman or in the center of a table with a centerpiece in it. The slats give this piece a hand-made feel. I love apothecary jars. While I have some various ones I use as decorations, I would still like to purchase some for my sugar, flour, and such. This set would be perfect for a farmhouse style bathroom. It comes in at just under $25.00. This set of 3 candlestick holders would look perfect up on top of a mantel. Although this item isn’t eligible for prime (but it does have free shipping), this set was at such a great price that I had to include it. If you want to spend a little more on your candle holders, this set of five candle holders are a unique way to add some Chip and Joanna style to your home. I love this piece for an entry way or kitchen. Not only does it look great, it is functional. For just under $40, you can grab this set of three wire wall baskets. They’re great for mail storage and other miscellaneous office or kitchen items. Metal lanterns with a candle (real or fake), add a little bit of ambiance to a room. This lantern would work well on top of a mantel or sitting on a fireplace hearth. I love this rustic blanket ladder, I wish I could have it in my home. Right now, a blanket ladder would only aide my youngest son in his quest to climb everything and anything in our home. Wouldn’t this tray look fabulous in a kitchen filled? Or maybe even in an office for some added storage? If you’d like a little rustic charm, this tray can help get you there. While this tray has a similar feel as the one above, it’s a completely different shape and size. The little ring at the top adds an extra bit of detail that takes it up a notch. Need some end tables? While I love the idea of mismatching end tables, this pair is too sleek to pass up. Want to add a little extra detail to your parties? These adorable signs fit the bill. Need a larger chalkboard? The wooden frame takes an ordinary chalkboard and makes it special. Have you checked out Amazon Handmade yet? It’s a section on Amazon where smaller-based companies sell their handmade items. It’s similar to ETSY. By purchasing handmade, you get to make a real person do a happy little dance. Need a little cotton for a special jar or vase? This three pack is a great deal. These quaint jugs would fit well on a bookshelf or mantel. If you’re loving the cotton from above, the white or green jug would hold them quite nicely. Don’t forget that textiles can bring a lot of farmhouse style to any home. These simple floral flour sack towels would add an extra layer of texture and warmth to any kitchen. Want to remember this list for later? Pin it.